Tricia Messeroux, a New York photographer, has been capturing children in red carpet looks from the Oscars, Grammy and Golden Globe award ceremonies, and blockbuster movies ever since her idea of dressing up her daughter as a celebrity in 2008 gave birth to Toddlewood Studio in Baldwin, New York. The biggest wedding of the year inspired her to recreate the cast, including Markle’s mother Doria Ragland, Prince Charles and his wife Camilla, bishop Michael Bruce Curry and cellist Sheku Kanneh-Mason. 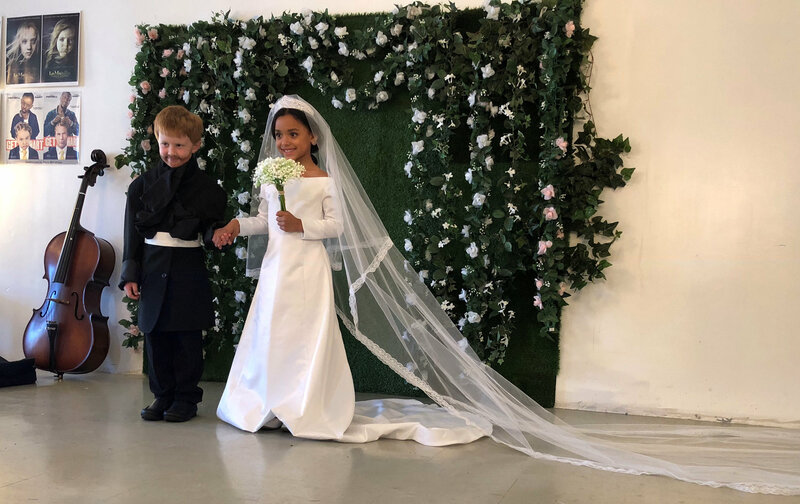 As the bride, Naiyah Otero, 7, wore a version of Markle’s boat-necked Givenchy wedding gown as interpreted by Esaie Couture. “I think she’s pretty and it’s an honor to marry Prince Harry, like, dress up as her,” Otero said at the photoshoot on Tuesday. Andrew Robert Joy, 6, embodied bearded Prince Harry with the help of eyebrow pencil on his smooth jawline that matched his close-cropped red hair. Messeroux and her team give themselves only 48 hours to mimic the looks and set design for her big annual project. “Hopefully, it’s going to look good and hopefully nobody can tell but we’ll see,” she said.